A man hanging around in his garden in eastern Turkey discovered a Near Eastern fire salamander, which is listed as a "Near Threatened" (NT) species in the IUCN Red List of Threatened Species. 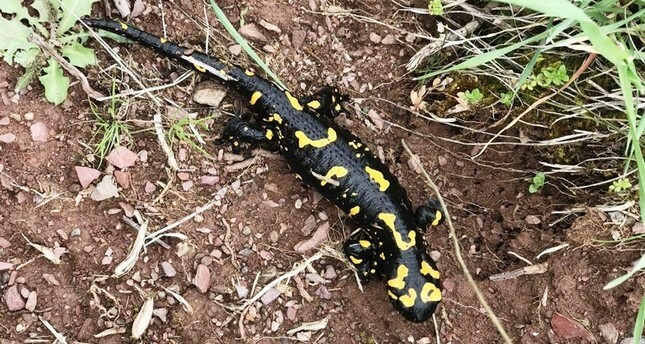 Eyüp Taşer had initially thought a lizard was behind the bushes, but he realized that it was salamander after seeing the unique yellow spots on its back, he told reporters. He took a photo of the animal and released it back to its natural habitat after learning that the species was near-threatened. The species is found in subtropical dry shrubland and forests in Middle Eastern countries such as Iran, Iraq, Lebanon, Israel and Syria. Their habitats are negatively affected by traffic and the drying up of water bodies.